D-STAR and DV Dongles, Winlink, FL-Digi and D-RATS. Are you up on all of these modes? I’m not either! Good news: Free workshop in Gwinnett County is Saturday, April 8, 2 pm to 6 pm! The Amateur Service will officially get two new bands in the near future. The FCC has adopted rules that will allow Amateur Radio access to the 630 and 2,200-meter bands, with minor conditions. A Report and Order (R&O) was released on March 29. The new rules become effective 30 days following publication in The Federal Register. The R&O, which also addresses several non-Amateur Radio issues, allocates the 472-479 kHz band (630 meters) to the Amateur Service on a secondary basis and amends Part 97 to provide for Amateur Service use of that band as well as of the previously allocated 135.7-137.8 kHz band (2,200 meters). The R&O also amends Part 80 rules to authorize radio buoy operations in the 1900-2000 kHz band under a ship station license. but the good news is that it doesn’t have to be very high off of the ground. I’m not sure if the polarization is vertical or horizontal either. ??? A good field trip for the club would be to go see someone’s setup! The FCC said the Amateur Radio service rules it has adopted for 630 meters and 2,200 meters allow “for co-existence with Power Line Carrier (PLC) systems that use these bands.” Utilities have opposed Amateur Radio use of the MF and LF spectrum, fearing interference to unlicensed Part 15 PLC systems used to manage the power grid. On Sunday April 16, 2017, the club is going to operate W4DV at the GA Welcome Center on I20W. We will be participating in the ARRL Rookie Roundup Contest from 2PM until 6PM. Setup will begin around noon. We are using this as both an outreach opportunity to expose the general public to Amateur Radio as well as trying to contact as many newly licensed “Hams” as possible. A “rookie” is considered someone who been licensed within the last year. If you have the time, come on out and be a part of the event. You can operate, talk to walk-up folks and answer questions about the hobby, and just have a great time visiting with everyone, enjoying the event, and promoting/exposing Amateur Radio to the general public. I realize some of you have other commitments that day and won’t be able to join us. However you CAN HELP US! We are going to have a 2m station on site operating as W4DV on 145.490. We plan to have anyone particularly youngsters who drop by operate the station under the supervision of one of our on-site control operators. This is where you come in. If you keep your radio with you during the day wherever in the CSRA, you can be one of the contacts to answer the call and talk with them. The more the merrier! So I hope to see as many of you as can come to the event OR be a part of our outreach program by standing by and answering the W4DV call. If you want more information on the event, contact one of our event coordinators: Ryan Ruby (NE1AM) ryan.ruby@gmail.com or Bob Hunter (KC4KN): bob@guale.net. It’s a definite: The Fort Worth, Texas-based retailer RadioShack said in bankruptcy court that they are closing about 200 stores and evaluating options on the remaining 1,300. They will take credit cards over the telephone (orders, too?). ARS asks that you please call their office at (706) 250-0126 and leave a message for them to call you back to process your order. Even though American Radio Supply does not have a store front for us local hams, they are local which often means one-day shipping if your order comes out of Georgia and not one of the other four locations. If we want them to prosper and be around for us, we all need to support Amateur Radio Supply. 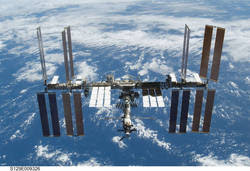 Amateur Radio on the International Space Station (ARISS) reports it has met a major milestone and now is “one giant step” closer to flying its new interoperable radio system to the International Space Station. Eventual plans call for installing a new JVC Kenwood TM-D710GA-based radio system on the station as part of an overall approach that will allow greater interoperability between the Columbus module and the Russian Service Module. Lou McFadin, W5DID, and Kerry Banke, N6IZW, travelled to NASA Johnson Space Center (JSC) in Houston in mid-February for preliminary testing of Banke’s “breadboard” version of the ARISS multi-voltage power supply that’s essential to the upgrade. They worked with JSC engineers and Electromagnetic Compatibility (EMC) Lab personnel to put the specially built power supply through its paces, checking against US and Russian space specifications for preliminary power quality and EMC tests. With positive test results in hand, ARISS now can move on to the next step — fabrication of prototype and flight units. The JSC engineers said the ARISS breadboard power supply was the first hardware to have passed all of the space agency’s tests and complimented the ARISS Team on its professional-level hardware development and design. “I was looking to come away with what we needed to move forward,” said Banke. “We achieved that.” Banke also said he was impressed with the support he and McFadin received from the testing group. Key players on those teams, who are also radio amateurs, told him and McFadin that they find equipment supported by hams earns particularly good marks. ARISS-International Chair Frank Bauer, KA3HDO, thanked Banke and McFadin for spending several days putting the unit through the rigorous battery of NASA and Russian preliminary electrical tests. McFadin credited the level of cooperation and experience within the ARISS Team with the multi-voltage power supply’s high marks. Now that testing of the breadboard unit has been completed, McFadin can purchase the necessary — and pricey — space-certified parts, to fabricate the final prototype and flight power supplies. He and Banke expressed confidence that the prototype and flight units will pass the even more rigorous final testing with flying colors. The ARISS radio gear on board the ISS is aging. A February supply vehicle carried a new Ericsson 2-meter handheld radio to replace one that failed a few months ago, disrupting ARISS activities. The VHF radio in the Columbus module was used for school group contacts and for Amateur Radio packet, temporarily shifted to UHF after the VHF radio failure. The newly arrived Ericsson radio will replace the Ericsson UHF radio supporting APRS packet and some school contacts, but Bauer made it clear last month that the new Ericsson transceiver is an interim measure. To help support final fabrication and flight tests of the ARISS interoperable radio system, visit the ARISS website. Contributions are tax deductible. Those contributing at least $100 will receive an ARISS Challenge Coin. Our new 2-meter repeater antenna and 7/8″ hardline are in; the 24′ long antenna is completely assembled; it’s all just sitting inside at the repeater site waiting to be put up . . . and it will – just as soon as we get an unwindy (word?) and low %’tage chance of rain Friday, Saturday & Sunday! K4BR will put out an email as soon as possible before a hopefully unwindy and unrainy weekend – we’ll need everyone’s help for moral and ground support. If you haven’t been out for a workday yet, it wouid be particularly great to see you! We worked on it yesterday – more getting ready only because it was still too windy to go up the tower yesterday. I’m going to install it in the car. Gigaparts.com and Icom are offering a rebate of $40 – that rebate offer should be good through at least the end of April taking the cost of the radio down to $490 delivered. I already have a Thumb DV™ D-STAR USB device from Northwest Digital Radio on my Windows computer. ♦ Who else is going to get into D-STAR?